HIGHER THREAD COUNT =/= BETTER QUALITY. The ideal thread count for your sheets depends entirely on the type of sheets you are going to buy. This is because the meaning of thread count is simply the amount of threads that fill a certain area of your sheet. Therefore the finer the material your sheet is made out of the higher thread count can be. 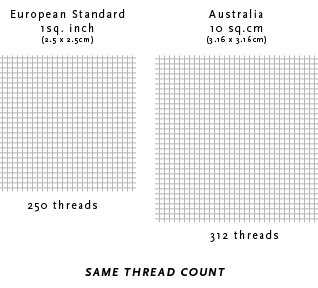 The European standard is the amount of threads that occupy one square inch, while in Australia it is more common to use 10 square centimeters. The lack of an international standard means that even sheets with the exact same thread density can be labelled as having different thread counts. As you can see from the above image there can really only be a certain number of threads that can fit into the defined area. So the idea that thread counts can go up to some of the huge numbers you see on some packaging just doesn’t make sense. It is also true that fitting the maximum amount of threads into the square inchageof a sheet sheet is not necessarily ideal. Just because a certain amount of threads can fit in a defined area, this doesn’t necessarily mean it is a good thing. For example, linen is a very high quality fabric, but can have a thread count as low as 50. Its thread count is only low because of the way that the fabric is woven to provide its looser weave and finish. Why do so many sheets have thread counts with such high numbers? Over many years of marketing thread count has been highly associated with being a mark of quality. Many sheet companies have hijacked this loose understanding about thread count by trying to promote the idea that the higher the number the better bed sheets are (and more expensive). So, How Can I Determine the True Thread Count of My Sheets? As you have no way of measuring the thread counts of your sheets yourself, the above information can seem a little disheartening. However if you read through this website and do your research you will be more than equipped to find the brands out there that are honest and upfront about their sheets. To start with is is important to know that each type of fabric has an ideal thread count. You can read about the ideal thread count ranges for every fabric type here. But it is also important to know that thread count is only a small factor when it comes to assessing a bed sheets quality. You can read about the other factors that affect sheet quality here.